Artist and curator Caroline Rannersberger had a busy time last week with two new exhibitions opening at Charles Darwin University. Ms Rannersberger has curated Kakadu Mulil Bim – an exhibition of works by Kakadu artists which will be displayed in The Gallery, Building 12, Casuarina Campus. At the same time her own exhibition Sublime Journey goes on show in the Northern Editions gallery space in Building 33, Charles Darwin University. Both exhibitions were opened by Arts Minister Marion Scrymgour on Friday 20 April. Ms Rannersberger has been working with artists from Jabiru and the homelands of Kakadu to teach them the art of printmaking. The artists have learnt the craft during VTE workshops held both in Kakadu and at the printmaking department on the Casuarina Campus under the tutelage of remote delivery lecturer, Leon Stainer. 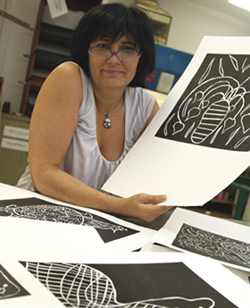 While some of the artists are school students who have shown an aptitude and talent for printmaking, others are experienced Indigenous artists who have successfully made the transition to printmaking. Among the artists showing their work in Kakadu Mulil Bim are Tim Djandjomerr, Abel Naborlhborlh and Ivan Namarnyilk, whose paintings have contributed to the Kakadu art movement. Ms Rannersberger’s own work in Sublime Journey explores her identity as a German-Australian, using as its starting point illustrations from the novel The Adventures of Simplicissimus. Written in 1669, this tale of a man’s journey of self-discovery is regarded as the first German novel. The artist has taken images and ideas from the novel and created her own multi-media suite of prints that reflect her personal journey of self-discovery. Ms Rannersberger was born in Australia of German parents, and spent most of her secondary schooling in Austrian and Australian schools. She studied at the University of Vienna in Austria and later studied art in Australia. 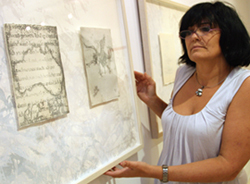 Her exhibition is part of her work for her doctorate in visual arts at Charles Darwin University. Kakadu Mulil Bim will be on show in The Gallery, Building 12, Casuarina Campus until May 4. Sublime Journey will be exhibited in the Northern Editions gallery, Building 33, Casuarina Campus until 18 May. Both galleries are open 10am to 4pm Monday to Friday or by appointment through Northern Editions on 8946 6325.